The sun's energy is unlimited, free and clean, and the amount that hits Earth in one hour is equal to the amount of energy used in one year by the entire planet. Yet, although installed global photovoltaic capacity increased almost nine-fold and the price of solar panels dropped by two-thirds between 2008 and 2013, only 1 percent of U.S. and global electricity generation come from solar energy, according to a new MIT report. "For photovoltaics technology to become a major sustainable player in a competitive power generation market, it must provide abundant, affordable electricity, with environmental impacts dramatically lower than those from conventional power generation," according to Vasilis Fthenakis, a senior research scientist and professor of earth and environmental engineering at Columbia University, and the founder and director of the Center for Life Cycle Analysis. Where does solar energy stand today, and where does it need to go in order for us to make the transition to renewable energy? Let's look at solar photovoltaic technology, since that provides most of the solar electric generation in the United States and the world today. Crystalline silicon wafer-based photovoltaic is non-toxic, abundant and reliable, but it does not have good ability to absorb light, so the silicon wafer must be thick, which contributes to its rigidity. These solar panels are complex to manufacture and relatively expensive; but crystalline silicon wafers' solar-to-electric power conversion efficiency rate has reached 25 percent, the highest for commercial applications. In solar cells constructed of a single layer of semiconductor, all materials have the potential to reach 30 percent efficiency at best. This is because each type of semiconductor is activated by its own specific band gap, the amount of energy that it can absorb and convert into electricity. 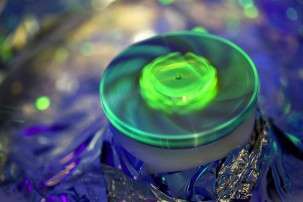 "If you have more energy than that, it's wasted as heat, and this reduces the efficiency of converting photons to electrons," explained Fthenakis. "…If the absorbed energy is lower than the material's energy band gap, you don't have any activation of electrons. So a third is wasted because it's too hot, a third of the energy is lower than what's required. … That leaves about 33 percent, some of which will be reflected back. That will take us down to 30 percent efficiency." "Some people argue that solar needs to be improved in order to be deployed on a large-scale," said Fthenakis. "I think what we have now is good enough for the best areas (i.e. with plenty of sun). Now if we want solutions for, say, the north of Europe, then we need technologies that have higher efficiencies." Quantum dot photovoltaic uses nanocrystals made of semiconductor materials that take advantage of the laws of quantum mechanics. Because the size of the nanoparticles can be changed, they can be tuned to absorb energy from different parts of the solar spectrum, including parts of far infrared wavelengths, which constitute half of the sun's energy. Quantum dot photovoltaic has only reached 9.2 percent efficiency, but it is inexpensive to produce and can be sprayed or painted on. U.S. Army scientists recently patented a new thin-film cell that combines layers of silver and gold between semiconductor layers, but is only a few hundred nanometers thick (a human hair is about 80,000 nanometers thick). It is 1,000 times thinner than solar cells in existing solar panels, less expensive and more robust. Moreover the silver and gold enable the cell to absorb and convert more of the ultraviolet and infrared spectrum, and the cell's geometry allows it to absorb sunlight from any angle. With the exception of concentrators, third generation photovoltaic technology is still in the lab stage, 10 to 20 years away from commercialization, said Fthenakis. Of technologies that are in commercial use today, thin film costs the least in terms of square meters and how much power it can deliver. The leading technology is cadmium telluride, because it's easier and faster to manufacture, and thus costs less. "Thin films need to increase their efficiencies. And crystalline silicon needs to decrease its cost," said Fthenakis. "At some point there will be an overlapping there." To expand the use of solar energy, installed costs must come down, technologies that can scale up cheaply need to be developed, and solar energy has to be smoothly integrated into the grid (which will involve enhanced ways to store the intermittent energy), says the MIT report. Photovoltaic system integration and storage optimization are key research topics in the Center for Life Cycle Analysis at Columbia. Elsewhere, ongoing research is focused on three key areas of photovoltaics: higher power conversion efficiency, use of more commonly found and abundant materials, and reduced manufacturing complexity and cost. According to the MIT report, "No single photovoltaic technology today excels in all three key technical characteristics." In Sandpoint, Idaho, Scott Brusaw, an electrical engineer, is developing a solar roadway that involves a specially treated glass surface (to provide traction), with solar panels, a heating element and LED lights inside. 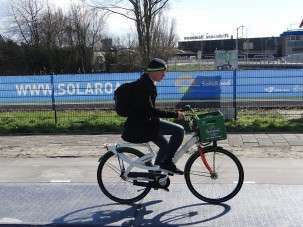 The solar roadway can produce solar energy, keep roads warm enough so that snow doesn't collect, generate warnings and instructions to drivers with its LED lights, and potentially provide a charging infrastructure for electric vehicles. So far, Brusaw has created a demo parking lot made of 108 solar panels in Sagle, Idaho. In the United States, the solar tax credit of 30 percent on residential and commercial solar systems is set to expire at the end of 2016. Obama's proposed budget for 2016 asks Congress for a permanent extension of the solar tax credits. 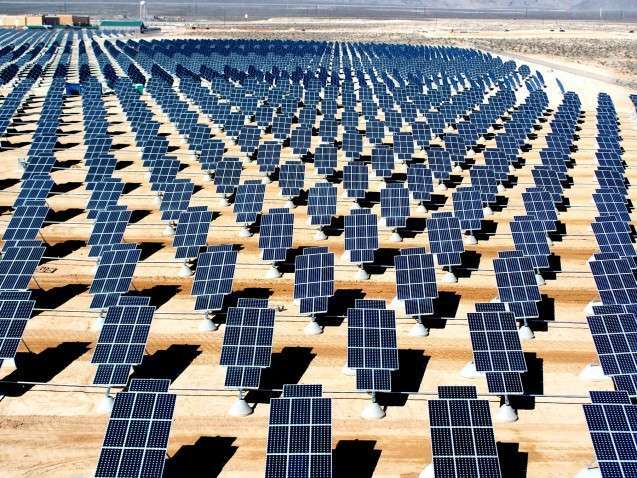 Hopefully they will be extended so that the expansion of solar power can continue, since the key to widespread implementation of the technology is its cost in comparison to other energy sources. "It's not fair to compare solar and wind with technologies that pollute," said Fthenakis. "We don't account for the societal costs of pollution from coal. … If we did, we'd see that electricity from coal is a lot more expensive than what we actually pay for it. This would make wind and solar much more appealing." While all these advancements were being made, the "new" carbon sequestrating technologies are being shut down. They'll be. They're not for now. 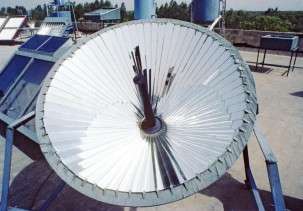 People, companies, countries are mostly waiting for more efficient way to gather solar energy. "Fortunately", some are purchasing the current generation solar panels, wind turbines and so on. They have a situation, spirit, wallet good enough to afford it. We'll have to wait a little more till we can finally spread news of affordable way for common people to use renewable energies. If they think what they'll use will have a fine durability and strike down their electricity bill, it'll be all good. Good discussion on conversion technologies, but converting solar power to electricity does not a solution make. You need to consider the entire system, including moving large amounts of energy around the grid, along with storing energy and shedding sinks for use when production is less than demand. Joe, nobody in the business thinks one can just replace one technology with another without integrating it intelligently. gkam - Sometimes these news releases are picked up by people who are not in the business, and get distributed to others who have not a clue. All I am saying is: In my way of thinking, the title of the article "Where is solar power headed" implies a more complete discussion of the system, not just the collector. This gives a quite good summary of the collector technology, which I appreciate, and which, I think, would be an adequate discussion maybe twenty years ago (except some of the discussed technology did not exist then, and the collector cost has come down exponentially since then). But today, where we need to rapidly phase out carbon based generation, I don't think this is adequate. The much larger problems are integrating solar into the system. If they would have at least mentioned this, then maybe someone would have been inclined to do a little further research. "It's not fair to compare solar and wind with technologies that pollute"
But it is fair to compare solar and wind with carbon-free nuclear; aside myths, beliefs, conspiracy theories, junk sciences, sensationalist websites, and scare tactics; nuclear is far more ecologically friendly. WillieWard - I would like to see a very fair, unbiased assessment of nuclear - I have reports and studies that go both ways, however, in all cases, I believe the authors have bias and get the answers they want. Nuclear reactors should, little by little, be dismantled until there's only few remaining, for tests, energy production and many other things we'll need for the future. I think the government should make huge wind and solar farms, and sell the energy to the end consumer. Cut out the CEO and other 0ver-payed individuals in the corporate model. Governments are historically responsible for infrastructure. Energy is infrastructure. Energy is also money; the true currency of nature. The constitution says Congress has the point to mint/coin money. Therefore the constitution logically gives congress power over the energy infrastructure, since energy is the real currency of nature. Why don't they uses this power? With lower paid, appointees managing government owned energy businesses, that would mean lower prices to the consumer, and profits from the company would go directly to paying down government debt. This system would be dramatically more efficient than what we have today in terms of wealth management, energy distribution, and government oversight. Just make clothes that trap solar energy; Then, toss the charged batteries from time to time into collecting stations for funds deposited into your account. What if those clothes rarely got out of the closet? Solar energy is headed towards a somewhat non-conventional direction. FTA: "It's not fair to compare solar and wind with technologies that pollute," said Fthenakis. Nonsense. We should look at the whole lifecycle costs of each technology, pollution and all. It takes a lot of energy to make many solar cell technologies. It takes a lot of energy to build a windmill. It takes loads of energy to store the output of either of these technologies and it doesn't store them particularly efficiently either. Furthermore, these things don't last forever. Most solar cells start to lose output after a few years of service. The useful life is rarely more than 25 years or so. All of these technologies produce pollution, some more than others. They all require energy investments. They also have ideal scales of operation. Saying that one shouldn't compare and contrast is the mark of a closed mind. It makes the most energy only when we need it the most. So use it when it's made and stop firing up those diesel backup generators.